By default, projects on CircleCI build in virtual environments with 4GB of RAM. This RAM is shared among all processes running in your project: databases, tests, various tools/frameworks, as well as the ravenous Java Virtual Machine (JVM). This is the most powerful Java environment variable. It’s read directly by the JVM and overwrites any other Java environment variables, as well as any arguments you pass on the command-line (i.e., java -Xmx512m -Xms64m). For this reason, _JAVA_OPTIONS_ isn’t typically recommended — a more focused approach usually gets the job done just as well. 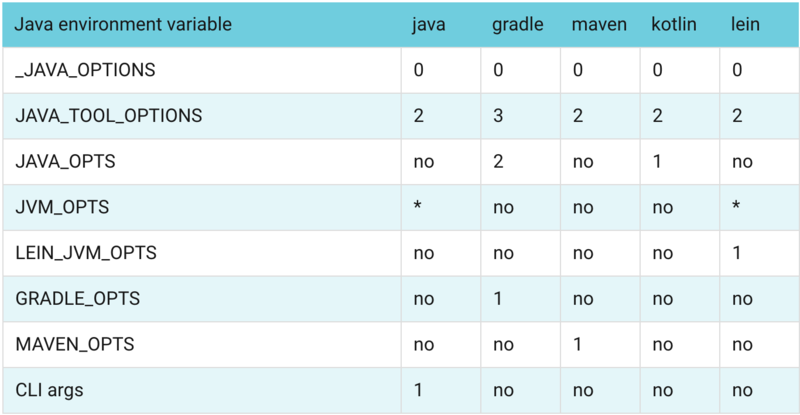 It’s also worth noting that _JAVA_OPTIONS is Oracle-specific, so it won’t work with everything. For example, you’d need to use IBM_JAVA_OPTIONS for IBM’s Java tools. _JAVA_OPTIONS_ isn’t typically recommended — a more focused approach usually gets the job done just as well.